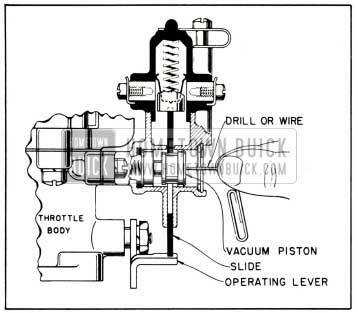 The 1951 Buick cranking system permits the engine to be cranked and started automatically, after the ignition has been turned on, by pressing down on the accelerator pedal. The cranking motor circuit is automatically opened and the 1951 Buick cranking motor is disengaged from the flywheel ring gear as soon as the engine starts running and the accelerator pedal is released. 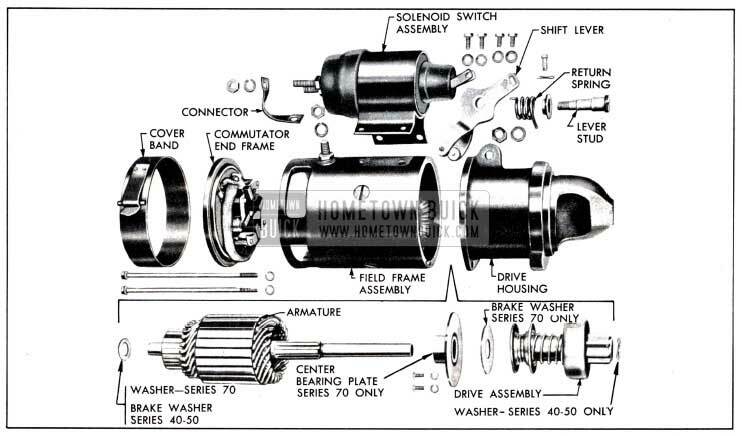 1951 Buick cranking motor, including the drive assembly which engages the flywheel ring gear during cranking operation (par. 10-35). Cranking motor solenoid switch, mounted on 1951 Buick cranking motor, for shifting drive assembly and closing the motor circuit. Solenoid switch relay, mounted on cowl, for operating the solenoid (par. 10-35). Accelerator vacuum switch, mounted on the carburetor and operated by both the throttle shaft and engine vacuum. This switch permits control of 1951 Buick cranking system by the accelerator pedal (par. 10-32 and 10-33). 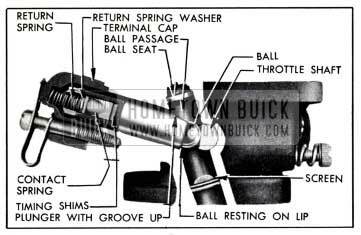 After the ignition switch is turned on, the 1951 Buick cranking system is set in operation to start the engine by pressing down on the accelerator pedal. This causes the throttle to open and the accelerator vacuum switch contacts to close, thereby allowing current to flow from the battery through the ignition switch, vacuum switch, solenoid switch relay windings, and generator windings to ground. See figure 10-28. NOTE: On Dynaflow Drive cars, the transmission control lever must be in neutral (N) or parking (P) position so that neutral safety switch is closed. The closing of the solenoid switch contacts causes the motor to crank the engine and also cuts out the “pull-in” coil of the solenoid, the magnetic pull of the “hold-in” coil being sufficient to hold the pinion in mesh after the shifting has been performed. 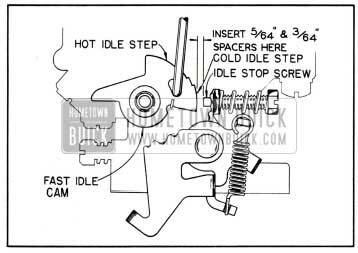 This reduces the current consumed by the solenoid while the 1951 Buick cranking motor is operating. Normally, as soon as the engine starts running and accelerator pedal is released, the manifold vacuum causes the accelerator vacuum switch to break contact and open the relay circuit. This causes the solenoid switch relay contacts to open, which breaks the solenoid circuit. A return spring on the shift lever stud allows the solenoid switch to open and then disengages the drive pinion from flywheel ring gear. In cold weather, if the first explosions are too feeble to keep the engine turning over, the manifold vacuum is not sufficient to cause the accelerator vacuum switch to break contact, and neither does the generator develop sufficient voltage to cause the relay points to open. 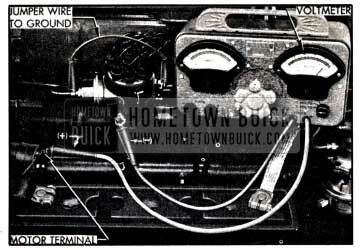 The 1951 Buick cranking system therefore remains in operation until the explosions are strong enough to keep the engine running. 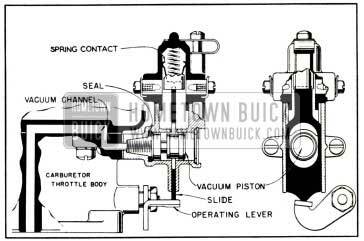 When the engine is running, there are three separate means of preventing the 1951 Buick cranking system from being operated by movement of the accelerator pedal: (1) Manifold vacuum acting on accelerator vacuum switch. (2) Mechanical lockout in the accelerator vacuum switch. (3) Blocking effect of generator voltage on solenoid relay. 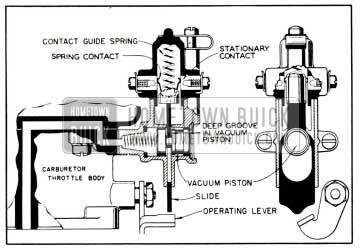 When the accelerator is depressed with engine stopped and ignition switch turned on, the flat spot on throttle shaft acts as a cam to push the switch ball, plunger, guide block, and contact spring upward until the contact spring touches both contacts in terminal cap. 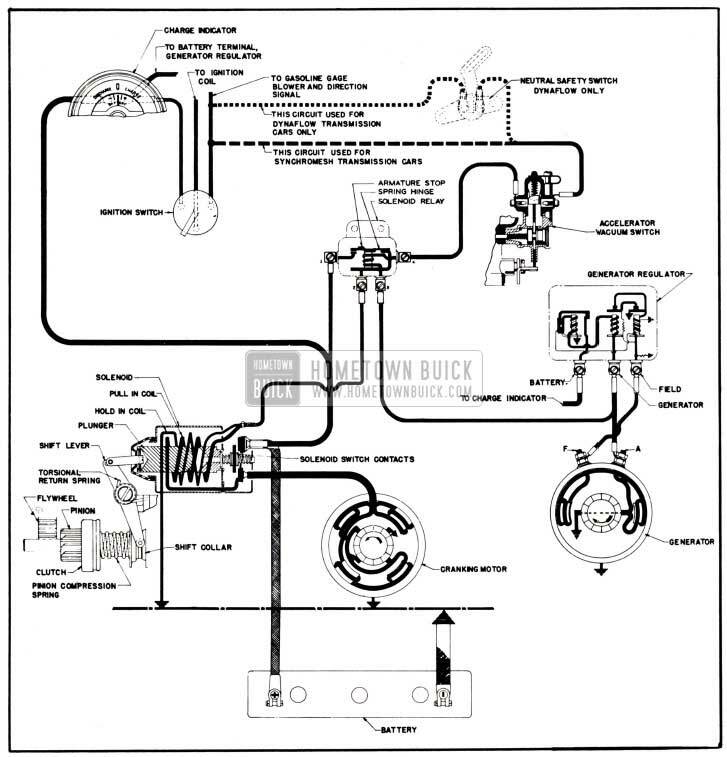 This closes the solenoid relay circuit and puts the 1951 Buick cranking system into operation. See figure 10-29, view B. When the engine starts, manifold vacuum acts on the switch ball and as soon as the accelerator pedal is released the ball is drawn upward away from throttle shaft. 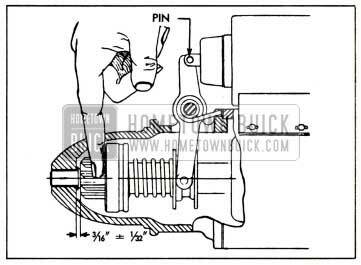 The return spring then pushes the contact spring downward, thus breaking the circuit and causing the 1951 Buick cranking system to stop operating. See figure 10-29, view C. As long as engine continues running the switch ball is held against its seat in throttle body by manifold vacuum; therefore movement of throttle cannot cause switch to make contact. As soon as engine stops, the ball drops to the starting position. Back off throttle stop screw, rotate fast idle cam to slow idle position if necessary, and full y close the throttle valve. Check condition of contact spring and replace it if burned or otherwise damaged. The free width of spring across the points, with return spring washer in place is 7/16” + 1/32” – 0. The free length of switch return spring is 11/16” to 3/4″. 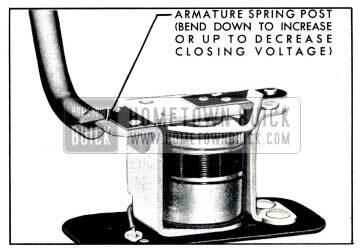 Replace a weak or distorted spring; do not stretch or alter spring as switch operation will be affected. The switch housing is provided with a horizontal cylinder barrel to which vacuum from the engine manifold is applied at one end by means of cored and drilled passages in the carburetor bodies. 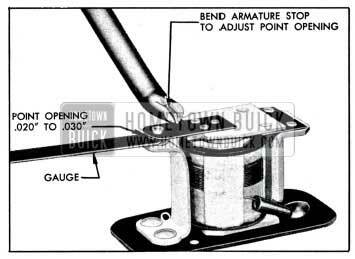 This end of the barrel is provided with a washer which forms a seal to prevent leaks when a piston opposed by a light spring is drawn against it by vacuum. The opposite end of the barrel is vented to outside air through a fine mesh screen which is held in place by a screen clip. A flat slide, actuated by an operating lever on the throttle shaft, moves in a confined slot in the housing and in a plane perpendicular to the axis of the cylinder barrel. This slide engages a cylindrical bakelite contact guide, the upward movement of which is opposed by a heavy contact guide spring. The contact guide carries a thin U-shaped spring contact which moves up and down within a bakelite terminal cap to engage stationary contacts for opening and closing the 1951 Buick cranking motor control circuit. The terminal cap is held in place by a cap screw and cap clip. See figure 10-34. Pressing down on the accelerator pedal causes the operating lever to move away from the slide. This allows the contact guide spring to move the- slide and U-shaped spring contact down to a position to bridge the stationary contacts in the terminal cap, thus closing the circuit. The slide moves into the deeper of the two grooves in the vacuum piston which has been positioned against the screen by the vacuum piston spring. See figure 10-35. Place 5/64” spacer between idle stop screw and fast idle cam while holding fast idle cam in extreme cold idle position. Close throttle so that spacer will hold cam in this position. See figure 10-39. Turn ignition on, hold spacer and open throttle. Engine should not crank. If the 5/64″ spacer causes the engine to crank, bend tang on operating lever downward. If the 3/64″ spacer does not cause engine to crank, bend tang on lever upward. In making either adjustment bend tang on operating lever only a slight amount each time until, by rechecking with the above procedure, the specified spacing is obtained. Use care in handling the U-shaped contact spring to avoid altering the dimension of the open end. The open end measures 3/16″ from outside to outside of the curved ends of spring. See figure 10-34. 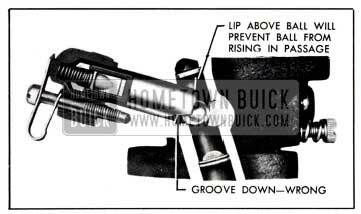 Dynaflow Drive cars are provided with a neutral safety switch which prevents operation of the 1951 Buick cranking motor except when the transmission is in the Neutral (N) or Park (P) positions. This switch is a safety feature installed for the purpose of preventing car motion when starting the engine. The neutral safety switch is connected in series with the 1951 Buick cranking motor control circuit, in the line between the ignition switch and the accelerator vacuum switch. It is mounted at the lower end of the steering gear column jacket and is operated by the lever at lower end of the transmission control shaft. 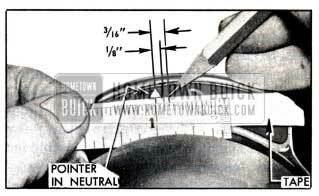 If the switch opens when center of pointer is less than 1/8″ from neutral, the 1951 Buick cranking motor control circuit may not be completed when transmission control lever is in neutral. If the switch remains closed when center of pointer is more than 3/16″ out of neutral, the cranking motor might be operated before the transmission is completely out of the driving (D) range. Check manual control linkage and adjust if necessary (par. 4-17). Gently tap neutral safety switch downward until cranking motor just starts to operate, then tighten switch mounting bolts without moving switch. 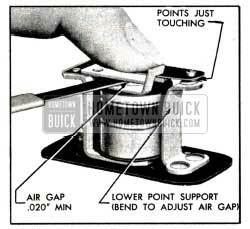 Helper should release accelerator pedal when 1951 Buick cranking motor starts to operate. 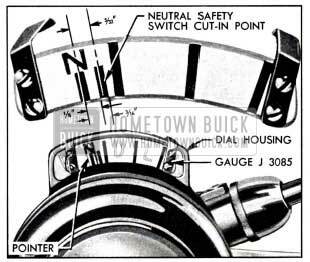 The 1951 Buick neutral safety switch timing can be most easily checked and adjusted by use of Gauge J 3085 as described above. If this gauge is not available, the following method may be used. Make two marks on masking tape at 1/8″ and 3/16″ from center of pointer. See figure 10-43. These marks give the same cut-in limits as provided by Gauge J 3085. 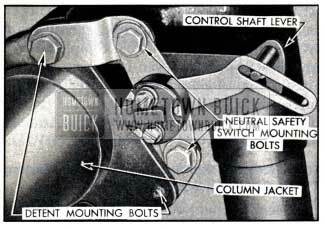 The 1951 Buick cranking motor assembly consists of a motor, drive assembly, shift lever, solenoid switch and relay. See figure 10-44. It is mounted on the flywheel upper housing on the right side of engine. The drive assembly is mounted on the motor armature shaft and keyed to it by splines so that it can be moved endwise on the shaft by the solenoid operated shift lever. It transmits 1951 Buick cranking torque to the flywheel ring gear, but allows the drive pinion to rotate freely with reference to the armature shaft when the engine begins to operate, thus preventing the armature from being driven at excessive speed by the engine. The solenoid switch not only closes the circuit between the battery and the 1951 Buick cranking motor to produce cranking action, but it also operates the shift lever to move the drive pinion into engagement with the flywheel ring gear. 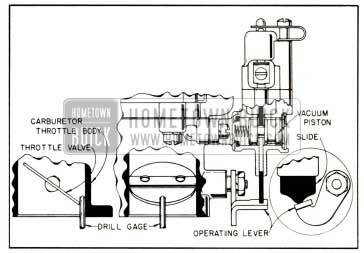 Operation of the solenoid switch and relay, as well as the entire 1951 Buick cranking system, is described in paragraph 10-31. 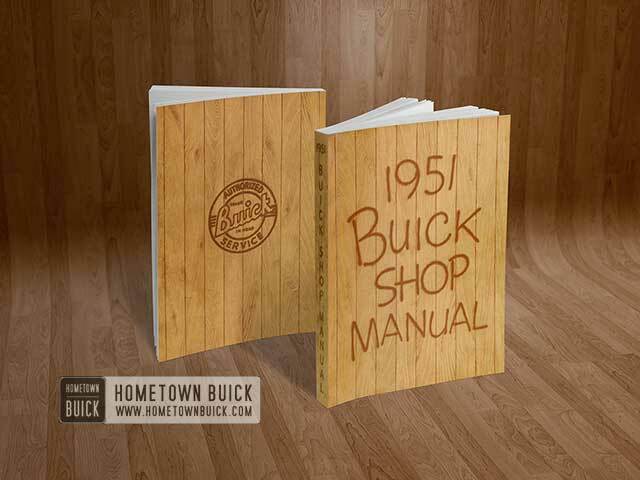 As a general rule, the 1951 Buick cranking motor should be tested and inspected every 5000 miles to determine its condition; however, the type of service in which some cranking motors are used may make more frequent inspection advisable. Frequent starts, as in city operation, excessively long cranking periods caused by hard-starting engine conditions, excessively dirty or moist operating conditions, all will make more frequent inspection advisable. 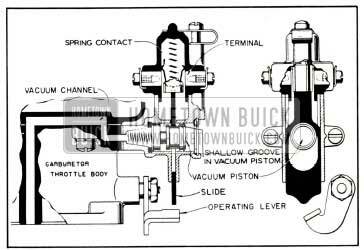 1951 Buick cranking motor action is indicative, to some extent, of the cranking motor condition. A cranking motor that responds readily and cranks the engine at normal speed when the control circuit is closed is usually in good condition. The following inspection should be made, however, to insure continued satisfactory operation. Remove commutator cover band and inspect it for thrown solder which results if 1951 Buick cranking motor is subjected to excessively long cranking periods, causing it to overheat. Since thrown solder results in loose or broken connections between armature windings and commutator riser bars, which usually causes burned commutator bars, the motor must be removed for repairs (par. 10-41). Check condition of brushes; make sure they are not binding and that they are resting on the commutator with sufficient tension to give good, firm contact. Brush 1eads and screws must be tight. If the brushes are worn down to one-half their original length, compared with new brushes, the motor must be removed for installation of new brushes. If commutator and brushes are in good condition but dirty, they may be cleaned without removal of motor. Clean off any grease with a cloth soaked with carbon tetrachloride or other non-inflammable solvent. While motor is operating, quickly polish commutator with a brush seating stone or with a strip of 2/0 sandpaper placed over a wooden block having a smooth square end. Do not use emery cloth. 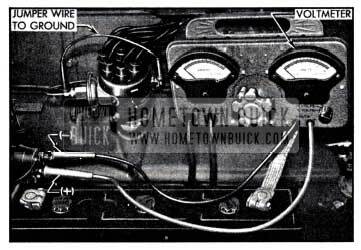 To operate 1951 Buick cranking motor, turn ignition switch off and connect a jumper wire between battery terminal of solenoid switch and the terminal of solenoid relay to which the wire with black parallel tracer is connected. CAUTION: Do not operate 1951 Buick cranking motor more than 30 seconds at a time without pausing to allow motor to cool for at least two minutes; otherwise; overheating and damage to motor may result. After cleaning commutator, blow out all dust from 1951 Buick cranking motor. Check motor and solenoid switch attaching bolts to make sure these units are solidly mounted. Inspect and manually check all wiring connections at solenoid switch, solenoid relay, generator regulator, generator, accelerator vacuum switch, ignition switch, No. 1 terminal of headlamp lighting switch, charge indicator, and neutral safety switch (Dynaflow Drive cars only). Make sure that all these connections in the 1951 Buick cranking motor and control circuits are clean and tight. It is advisable to test the 1951 Buick cranking circuit to make certain that excessive resistance does not exist. See paragraph 10-37. The voltage across the 1951 Buick cranking motor and switch while cranking the engine gives a good indication of any excessive resistance. NOTE: Engine must be at normal operating temperature when test is made. Connect voltmeter positive (+) lead to the motor terminal on solenoid switch; connect voltmeter negative (-) lead to ground on engine. See figure 10-46. Turn ignition switch on, crank engine and take voltmeter reading as quickly as possible. If cranking motor turns engine at normal cranking speed with voltmeter reading 4.5 or more volts, the motor and switch are satisfactory. If cranking speed is below normal and voltmeter reading is 4.5 or greater, the cranking motor is defective. CAUTION: Do not operate cranking motor more than 30 seconds at a time without pausing to allow motor to cool for at least two minutes; otherwise, over heating and damage to motor may result. 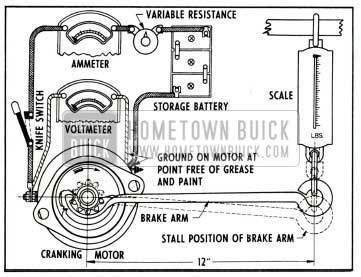 If 1951 Buick cranking motor turns engine at low rate of speed with voltmeter reading less than 4.5 volts, test solenoid switch contacts as follows. If switch contacts are satisfactory, or voltmeter reading is still less than 4.5 volts after switch has’ been repaired, test battery cables as described in paragraph 10-21. When the solenoid switch relay is operating properly, the contact points will close at 1.3 to 1.6 volts, and will open at 0.7 to 1.5 volts after armature has been attached to core, when tested with relay cold (at room temperature). The relay must cut in at this low voltage so that it will operate during cold weather with a low battery. Set rheostat to provide full resistance then connect rheostat leads to relay terminals marked 1 and 4 in figure 10-48. Connect voltmeter leads to relay terminals marked 3 and 4 in figure 10-48. Turn rheostat to slowly decrease resistance while watching voltmeter. Note voltmeter reading at instant that relay points close and solenoid switch operates. Voltmeter reading should be between 1.3 and 1.6 volts just before voltage drops off as cranking motor operates. As quickly as possible, increase resistance while watching voltmeter. Voltmeter reading should be between 0.7 and 1.5 volts at instant that relay points open and engine stops cranking. When the solenoid switch relay does not operate within the voltage limits specified in subparagraph a above, five checks and adjustments must be made in the following order: Air gap, contact point opening, closing voltage, sealing voltage and opening voltage. Remove relay from car and remove the cover, which is crimped in place. Push relay armature down until contact points just touch, then check air gap between armature and core with feeler gauges. Air gap should be .020″ minimum and may be adjusted, if necessary, by bending the lower point support. See figure 10-49. With armature free, check contact point opening with feeler gauges. 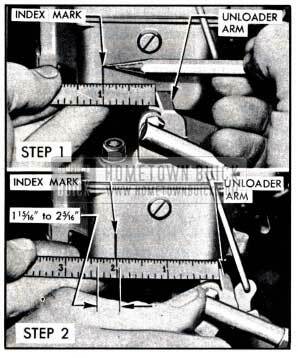 Point opening should be between .020″ and .030″ and may be adjusted, if necessary, by bending the upper armature stop. See figure 10-50. Connect a 6-volt battery and the 10 ohm rheostat in series between the relay terminals marked 3 and 4 in figure 10-48. Connect the low reading voltmeter between the same relay terminals. Slowly adjust rheostat to increase voltage until contact points close and note voltage. Closing voltage should be between 1.3 and 1.6 volts. If not within these limits, bend armature spring post down to increase spring tension and closing voltage, or bend up to decrease voltage. See figure 10-51. Recheck closing voltage after each adjustment. Check sealing voltage by continuing to raise voltage slowly after points close until armature seals to core. (This is usually accompanied by an audible click.) Sealing voltage should be not more than 2.4 volts. Cut out all resistance to completely saturate coil, then slowly reduce voltage until contact points open, and note voltage. Opening voltage should be between 0.7 and 1.5 volts. After all adjustments are completed, install relay cover and reinstall relay on car. 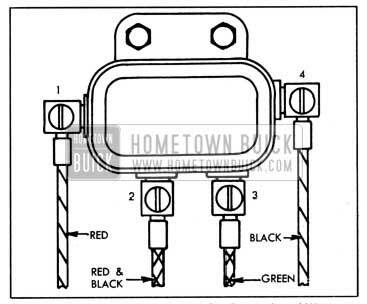 When the 1951 Buick cranking motor is removed from engine, the solenoid switch windings may be tested with switch either on or off the cranking motor. Two tests should be made to determine: (1) Current draw of both windings in parallel; (2) Current draw of hold-in winding alone. Remove the switch-to-motor connector and ground the switch motor terminal to solenoid base with a jumper wire. Connect a 6-volt battery, a variable resistance, and an ammeter of 100 amperes capacity in series with the base of solenoid and the smallest of the three terminal studs on switch. Connect a voltmeter between base of solenoid and the small terminal stud. Slowly adjust resistance until voltmeter reads 5 volts then note ammeter reading. This shows current draw of both windings in parallel, and should be 85 to 90 amperes at 5 volts, with solenoid cold (room temperature). Remove jumper wire from switch motor terminal and readjust resistance until voltmeter reads 5 volts, then note ammeter reading. This shows current draw of hold-in winding alone, and should be 14 to 16 amperes at 5 volts, with solenoid cold (room temperature). If the solenoid windings do not test within the specifications given, the solenoid switch assembly should be replaced. 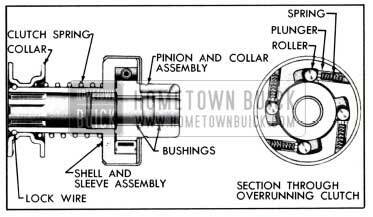 Whenever the solenoid switch is removed and reinstalled on 1951 Buick cranking motor it is necessary to adjust the drive pinion travel so that there will be a clearance of 3/16″ +/- 1/32″ between the end of pinion and the drive housing when pinion is in cranking position. Install solenoid switch and connect plunger links to shift lever, but do not install the switch-to-motor connector. Connect a 6-volt battery to the small relay terminal stud on switch and to ground on base of solenoid, then push solenoid plunger into solenoid by hand. Battery current will hold the plunger in the “bottomed” position while the pinion clearance is adjusted. Press finger lightly against outer side of drive assembly shell to ta.ke out all lash in shift linkage, but without compressing the clutch spring. Measure clearance between end of pinion and machined surface on drive housing. Clearance should be 3/16″ +/- 1/32″. See figure 10-52. If pinion clearance is not correct, loosen switch mounting screws and shift switch on 1951 Buick cranking motor to obtain specified clearance. Moving switch toward shift lever increases pinion clearance and moving switch away from lever decreases clearance. When specified pinion clearance is obtained, tighten switch mounting screws securely and install switch-to-motor connector. Connect a voltmeter between base of solenoid and the small terminal stud on switch. Connect a variable resistance (set for maximum resistance) between the 6-volt battery and base of solenoid, leaving battery connected to the small terminal stud on switch. Place a 3/4″ block between end of pinion and pinion housing. Adjust the variable resistance until solenoid switch contacts close and immediately note voltage before solenoid heats up. Contacts should close at a maximum of 4.2 volts with solenoid at room temperature. If switch contacts do not close at 4.2 volts maximum, check for binding in solenoid linkage, binding of pinion on armature shaft splines, etc. Correct any binding conditions and recheck switch closing voltage. To obtain full performance data on a 1951 Buick cranking motor, or to determine the cause of abnormal operation, the motor should be removed from the engine and be submitted to a no-load and a torque test. In the no-load test, the 1951 Buick cranking motor is connected in series with a 6-volt battery and an ammeter capable of reading several hundred amperes. A voltmeter is connected between the insulated motor terminal and ground on the frame at a point free of grease and paint. A speed indicator should also be used to measure the armature revolutions per minute. The torque test requires equipment such as shown in figure 10-53. 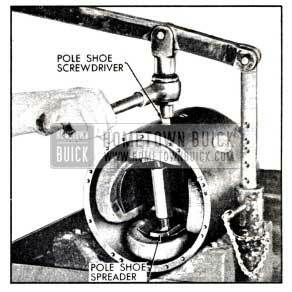 The 1951 Buick cranking motor is securely mounted and the brake arm hooked to the drive pinion. With a one-foot brake arm as shown, the torque will be indicated directly on the scale in pounds feet when the specified voltage is applied to the motor. Specified voltage is applied through the use of a high-current carrying variable resistance. Rated torque, current draw and no-load speed indicates normal condition of 1951 Buick cranking motor. Broken or weakened brush springs, worn brushes, high mica on the commutator, or other causes which would prevent good contact between the brushes and commutator. Any of these conditions will cause burned commutator bars. High internal resistance due to poor connections, defective leads, dirty commutator and causes listed under item 4 (c). Running free speed, an open armature will show excessive arcing at the commutator bar which is open. When it is necessary to disassemble cranking motor for any reason, make a complete clean up and inspection to make sure all parts are in satisfactory condition. See figure 10-54 for identification of parts. If field coils are to be removed from field frame, a pole shoe spreader and pole shoe screwdriver should be used to avoid distortion of frame. See figure 10-55. Carefully inspect all parts for wear or damage and make necessary repairs or replace unserviceable parts. If brush springs are distorted or show evidence of overheating, replace them. Any soldering must be done with rosin flux; never use acid flu x on electrical connections. Assemble 1951 Buick cranking motor by reversing disassembly procedure. If field coils were removed, use pole shoe spreader and pole shoe screwdriver to install them, to avoid distorting field frame and to insure proper tightening of pole shoe screws. See figure 10-55.